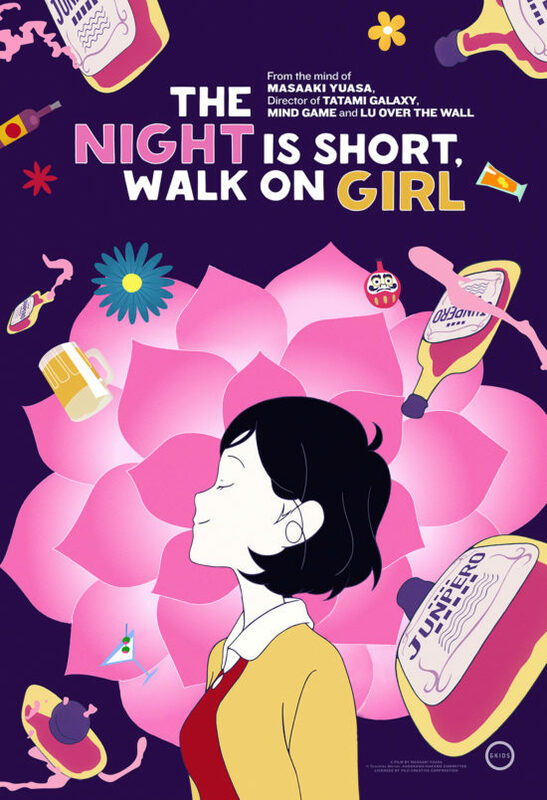 I just got home from a visit to my local AMC Multiplex where I saw Mr. Yuasa's new animated feature "The Night Is Short, Walk On Girl". 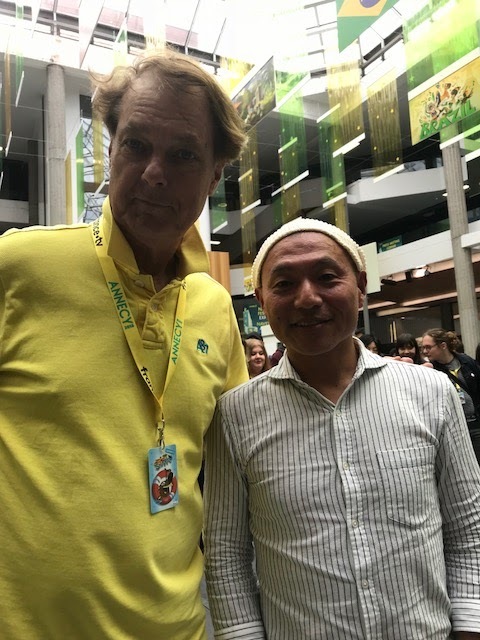 If you're a regular reader of Scribble Junkies, you know what a big fan I am of Masaaki and his feature film "Mind Game". I first saw it about 10 years ago and it blew my mind. 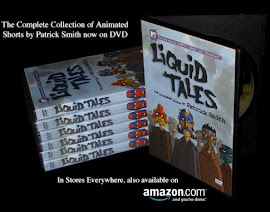 This is what an animated film should be - I called it "the Citizen Kane of animation". It was so imaginative, surreal, crazy and yet the drawings were so great. None of that Japanese animé crap, but really original artwork and ideas. However, I can't say the same for his new film. Maybe he's taking on too many projects since he's become famous, and his creative juices have run out. But "The Night Is Short, Walk On Girl" is as bland as you typical animé. The characters are badly designed and they move very awkwardly. The humor is clichéd (althought the mostly Japanese audience I saw it with laughed). There are maybe a couple of really funny sequences, but the narrative is a jumble of short stories that don't really build to an emotional finale. I heard that he made another feature film around the same time. I might recommend that he stick to one feature film at a time, and make that film something unique. I give "The Night Is Short, Walk On Girl" a C-. I just returned from Los Angeles, where we had the West Coast theatrical premiere of "Revengeance", and Jim Lujan, the film's writer, designer, voice-over star and overall creative genius, appeared with me on stage to introduce the film. We had great crowds all last weekend at the Laemmle Monica theater! Before that, we had premiered the film in New York at the wonderful IFC Center, where we also had good attendance, and the film got held over for a second week of late-night shows. If you ask me, that's the best time to see the movie, because in many ways it's a great late-night "stoner" film. After Jim and I finished the film in 2015, it traveled around on the film festival circuit for a while, where it was very popular, winning a few prizes even. After that, we searched for distributors for two years, and got turned down a lot. The worst part of that situation was that it delayed the theatrical release, which then in turned delayed the production of DVDs - after all, if the film's out on DVD, fewer people are going to go see the film in theaters. So that meant we also had to withhold delivery of the DVDs and BluRays that we promised to our Kickstarter backers, because the film hadn't been released in L.A. yet. So now, finally, after two years we can finally make some DVDs and fulfill our gifts to the remaining backers. So to all my supporters, we're making the DVDs now, have faith, your rewards will be on the way soon! Hooray! Speaking of Kickstarter, I ended up going back to the well again to raise money for the "Trump Bites" project, and I was afraid my fans are getting very tired of my requests for funding. As you may recall, I did three very successful animated shorts for the New York Times that made fun of our President. Unfortunately, the budget to make each 1-minute short is about $10,000 and the Times doesn't even pay that much. So we didn't turn a profit on them yet, and I was starting to go broke fast. That's why we turned to Kickstarter, to close the gap so we could make more episodes. It was a bit of a close call over whether we would meet our goal - and we made it with one day to spare, and even went a little bit over. Thank you so much, all you Plympton fans and supporters! Thanks to you, I'm working now on two more "Trump Bites" episodes, and I believe they'll be the best I've ever done. Thanks to the New York Times, the first three were seen all over the world, even in Siberia! Wait until you see the new ones, they'll make your brain explode! We now have plans to show "Revengeance" in theaters across America. So please watch for this wacky feature in a cinema near you. After that, we'll release the film on DVD and sell it on my web-site, and look for opportunities to stream it too! Please check my on-line store in a couple of months for details on how to order the film on DVD or BluRay. 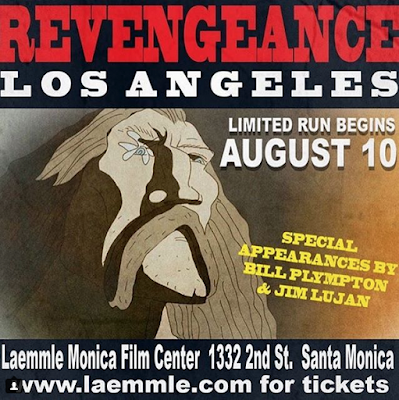 "Revengeance" screenings in Los Angeles! The NYC screenings of "Revengeance" are going well, in fact the IFC Center just held the film over for another week of late shows, so if you live near New York and you still haven't caught the film yet, it should play some more late shows August 10 to 16, so all you night owls will have another chance! Tickets are also NOW ON SALE for the "Revengeance" screenings in Los Angeles, starting on Friday, August 10 at the Laemmle Monica Film Center, 1332 2nd St. in Santa Monica. Show times are 1:20 pm, 3:25 pm, 5:30 pm, 7:40 pm and 9:50 pm. Now here's the big news, I'm flying out to L.A. so that I can introduce the 7:40 shows over the weekend, and do a Q&A session afterwards, and maybe we can hang around and introduce the 9:50 shows also. I'll also have some DVDs (of my other films) to sell, maybe some door prizes and of course I'll do a quick sketch for anyone who wants one. 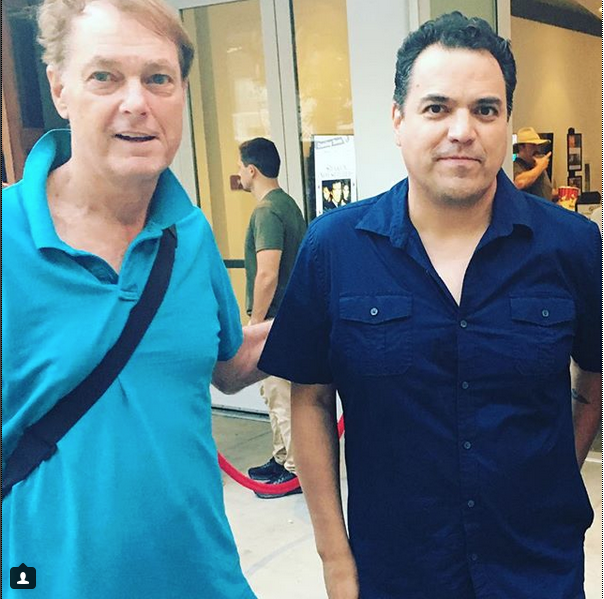 BUT the killer extra is that I'll be joined on stage by my co-director, Jim Lujan, he's also the writer, designer, musician and chief voice artist for the film. On top of THAT, he's also 100 times more entertaining in person than I am. The film got a great review from Owen Gleiberman in Variety, where he said the film is "engagingly scuzzy" and "hits its targets with fluky glee". 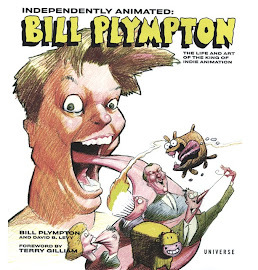 He also wrote that "Bill Plympton's latest hand-drawn feature is a scruffy collaboration that's like an updated Ralph Bakshi cartoon." Since Ralph is one of my heroes, I take that as a great compliment! So buy your tickets now, but you'd better wear a hat because "Revengeance" is so funny your brain will explode! And if you like "stoner" films this might be right up your alley! Please tell all your friends, spread the word and I'll see you there!